Arguably the hardest part of being a minor-league author in the current market is self-promotion and administration. Writers aren’t by their nature the most gregarious of people and would prefer to spend their time actually writing than adopting the role of media whore. But needs must, and it’s not always a matter of being unable to get an agent or publisher. To look at Steve Albini’s no-messing take on the music industry, the more people you’ve got working ‘for’ you, the more people you’ve got taking cuts from your already meagre royalty. The best way to go, especially in the Internet age, is to become self-managing. It does of course require immense discipline, and not inconsiderable balls. Needless to say, I have these (at least on a good day), and have not only been sorting (and continue to sort) platforms to perform segments from my ongoing project The Rage Monologues, but I’ve assembled an A5 pamphlet containing a selection of (but by no means all) the monologues penned so far. This evening, ahead of performances at The Black Light Engine Room’s night in Middlesbrough (Westgarth SC, Saturday 25th July 2015) and Clinicality Press’ evening of Spoke Word (The Fleeting Arms, York, 19th August 2015), I hand-numbered the 20 copies of The Rage Monologues pamphlets which arrived last week. I’m not vain enough to sign them. They look pretty great, if I do say so myself. They’re going to cost £3.50 / 1 pint. My set and performance style is evolving as the project goes on, and I’m hoping to announce more dates in the near future. Meanwhile, if you;re in or around Middlesbrough on July 25th or York on August 19th, do come on down. You know there’s nothing more you want than to have some guy shout in your face. 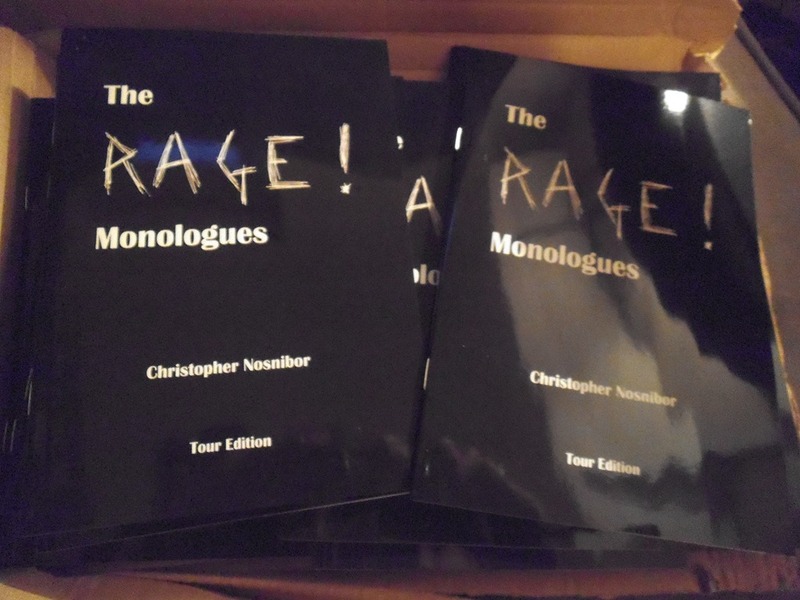 The Rage Monologues: a hand-numbered edition of 20. Buy them so I can eat.